Donna had been having injectable cosmetic treatments for over five years. In 2014, Donna felt that she wanted something more substantial to address her sun-damaged skin, sagging facial contours and sagging neck. Dermal Fillers and anti-wrinkle injections were not enough to do the job. 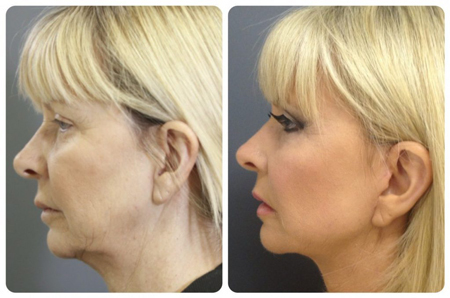 Having had a few surgical procedures in the past for non-cosmetic reasons, Donna was no stranger to surgery. After having done her research for several months, she opted to undergo the procedure with Dr Jadoon because she did not want to have the procedure done under General Anaesthesia. 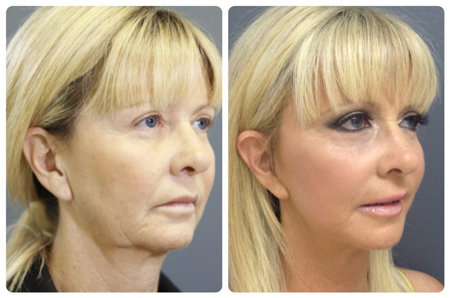 Dr Jadoon had already been doing Donna’s cosmetic injectable treatments for the past two years. As such, he knew Donna well. At the initial consultation, Dr Jadoon evaluated Donna’s suitability for the procedure. Once the decision was made that Donna was undergoing the procedure, she was informed about the mandatory cooling off period of at least two weeks. Thereon, a date was booked to suit her. She was given detailed instructions (both verbal and written) about preparing herself for the surgery. Please click here for details. Donna arrived at the clinic at 11 am. She was dropped off by her friend who was also going to pick her up after the surgery and was going to stay with her for a few days during the recovery. Donna was advised to have a healthy and light breakfast as her surgery was planned to be done under local anesthesia alone. She did not have to fast overnight (as is the case with surgeries done under general anaesthesia). After completing the necessary paperwork including consent forms, Dr Jadoon decided to have another consultation with Donna to make sure she was mentally prepared for the procedure and had followed pre-surgical instructions given to her a few weeks earlier. Clinical photography was carried out, followed by the clinical markings on Donna’s face. Donna was feeling a bit nervous, but the reception staff, clinic nurse and Dr Jadoon reassured her not to stress as the Mini Face Lift would be a relatively straightforward surgery and would not cause her any pain or discomfort once the local anaesthetic solution had gently infiltrated the treatment area. Donna was given a theatre gown to wear during the surgery. Pre-surgical baseline observations were carried out including blood pressure monitoring, heart rate, respiratory rate, oxygen saturation etc. 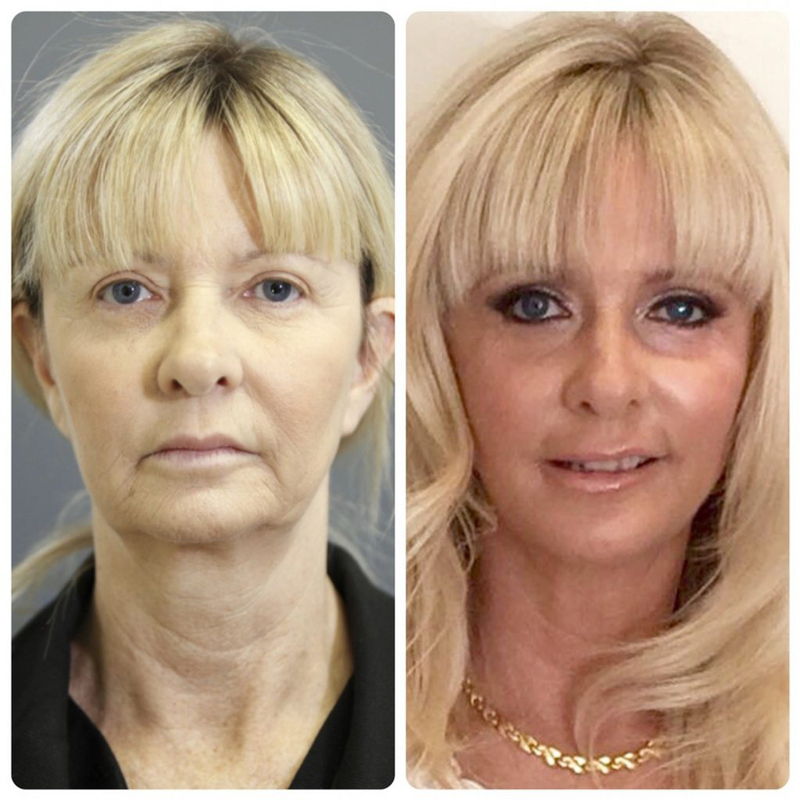 Donna’s Mini Face Lift surgery went smoothly. There was minimal bleeding as Donna had religiously followed the pre-surgical instruction given to her and avoided any oral medication or products that could cause thinning of her blood. Donna did not feel any discomfort as the area was completely anaesthetised. Dr Jadoon had 80’s soft rock music playing in the theatre as per Donna’s request. The surgery took just over 3 hours. Donna’s face was given a gentle clean using lukewarm sterile water to wipe off the betadine antiseptic solution. The dressing was applied, and she was transferred to the recovery room where the nursing staff measured her vital signs to make sure she was physically stable. Donna was given fresh fruit juice which she had using a straw and was also given oral pain relief tablets. Reception staff called Donna’s friend to come and pick her up from the clinic. Donna was given detailed post-surgical instructions along with Dr Jadoon’s personal mobile number in case of any emergency post-surgery. Donna’s friend was also given instructions on how to look after Donna during the recovery phase, especially during the first 24 hours post-surgery. Donna left the clinic just after 5 pm. At 9 am the following day, the nursing staff called Donna to ask how she went overnight and if everything was okay. Donna informed them that she had minimal discomfort after the surgery but did not get very good sleep due to the bandage wrapped around the sides of her face and head. She was advised to make sure to have a healthy breakfast. Donna arrived at the clinic accompanied by her friend. She seemed to be in good spirits. She was taken into the procedure room where her dressing was carefully removed and the wound edges were examined by Dr Jadoon. This was done to ensure she did not have any post-surgical bleeding overnight and that the skin in the treated area was looking pink and healthy. She had minimal bruising. A new dressing was applied and Donna was asked to come back again for another review in 7 days. She was instructed on how to carefully remove and reapply the dressing (crepe bandage) herself. She was informed that the clinic staff would call her every day over the phone to make sure she was doing okay. Donna was seen again on day seven by Dr Jadoon. She looked ecstatic about her new look and was very happy with the healing progress. Non-absorbable sutures were removed, and Donna was advised that she did not need to wear her dressing anymore. She was thereon asked to resume light physical activities again.